Plastic Holding tank rinser cleans out RV holding tanks. Fits standard hose fitting, and has a cut-off valve. 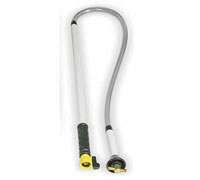 Eliminates the need to drag a garden hose into your RV - connects directly to bathroom faucet. Jet stream action completely flushes out all the nooks and crannies of your holding tank. Rinser wand comes with shut-off valve. The complete Holding Tank Rinser Kit includes rinser, plus a 6' hose and faucet adapter. Thoroughly flush your holding tank without bringing a hose through the window. Permanently installed built-in backflow preventer keeps sewage from contaminating water line. 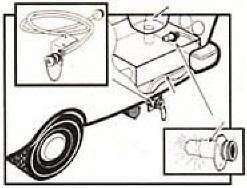 Hook garden hose to the connection (outside RV) and flush for 2 minutes or until water from discharge hose runs clear.